FSIP launched its new Xtender Regenerator and Xcell BMS at The Battery Show 2014. The Battery Show was an excellent opportunity to showcase FSIP’s new lead-acid battery desulfation & regeneration machine and its wireless BMS system for diagnosing cell health of the battery bank. The Battery Show was attended by industry leaders and R&D professionals in the electric vehicle, utility, renewable energy, medical, military and telecommunication fields. It’s geared toward advanced battery technologies that provide improved efficiency and cost reduction. It was an ideal show to debut the Xtender Regeneration technology. 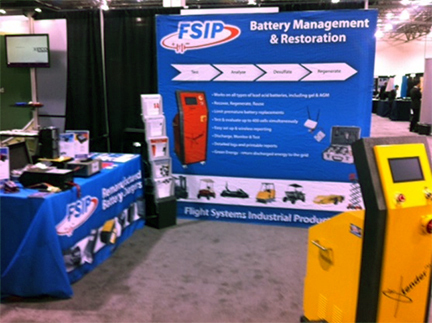 If you were unable to attend, you can find more information about how FSIP can help you with your battery management on our website or by calling toll-free 1-800-333-1194.